Leaves hair soft from the root to tips. 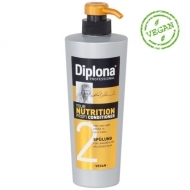 DESCRIPTION: Your Nutrition Profi Shampoo from Diplona is a shampoo with a vitamin complex, shea butter and wheat protein. This product cleans gently long hair. Silicone and paraben free. Vegan. 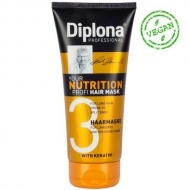 Continue the treatment with the conditioner and mask of the same line.